The first finalists for this season’s Gledhill Cup final are Eleven Sports Media after an enthralling 3-2 win at AFC Blackpool on Sunday against Ma Kelly’s Showboat. Eleven Sports came out of the traps at a great pace and took an early lead through Tyler Atack. It wasn’t too long before they got a second with a Lewis Cook header. Ma Kelly’s tried hard to stop the game heading beyond their grasp and Ben Seear poked home to reduce the deficit, but just before the break, Connor Finlayson was found unmarked to head home and restore Eleven Sports’ two-goal lead. The second half was slow as Ma Kelly’s struggled to make inroads into the defence until Brett Dawson scored to set up a tense finish. Eleven Sports had plenty of chances to put the game out of sight but Ben Fletcher came to the Kelly’s rescue. Then, right at the end, it looked like the game would go to penalties when Ric Seear found the net in the last minute but the flag was up. In the Bathroom Solutions Blackpool and Fylde Sunday Football Alliance Premier Division, Additions moved up to third with a 5-1 win at Exceptional Kitchens thanks to Nathan Hine (2), Liam Forrest, Ash Robinson and Dean Richards with Kyle Hendry replying. A Craig Harding hat-trick set Bloomfield Brewhouse on their way to a 7-2 win at 21st Century Windows. Liam Orr, Robbie Hunter and Ross Jones were also on target while Matthew Daniels and James Cholmondeley replied. In division one, New Albert continued their dominance with a comfortable victory at Clifton Rangers. Lee Barker scored twice with further goals coming from Dani Marr, Lee Grundy and Matthew Brown, while Adam Eldridge was on target for Rangers. There were two goals each for Simon Annetts and Kieran Fairnie as Excelsior moved into second spot after their 6-1 win at FC Kingsfield. Kyle Barlow and Cory Sellers also scored as Anthony Howarth replied. In division two, the Mount are only four points away from the title after a 5-4 win against the Bloomfield. Jack Williams grabbed a hat-trick with Kieran Hindle and Jack Hayton also scoring as BJ Whittle, Liam Jenks, Joey Crookall and Ashley Butcher scored for the Bloomfield. Daniel Smith scored the only goal as Little Black Pug beat Kirkham Town. Jack Pope scored for Blackpool Elite as they stunned Layton Seniors by holding them to a 1-1 draw. Kieran Wilson and Daniel Roberts shocked AFC Lane Ends with a 2-1 win for Fylde Rangers, Jack Yates replying. Thornton Cleveleys lost further ground at the top of the West Lancashire Football League Premier Division after slumping to a 2-1 defeat to Turton. 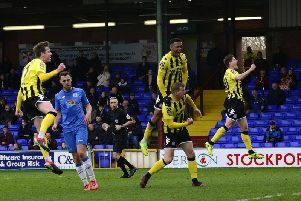 Kieron Sisson converted a 90th-minute penalty to condemn Thornton to defeat as they slipped down to third in the table. Rob Norton had earlier given Turton a first-half lead before Daniel Lock equalised for Thornton. It means they are now four points off league leaders Slyne with Hest – although they do have four games in hand still to play. Elsewhere, Poulton came out on top in a five-goal thriller in their match against Fulwood Amateurs thanks to Max Landless’ last-minute spot-kick. Josh Whittaker had given them a 14th-minute lead only for Harry Dunn to level for Poulton. George Byrne put Poulton back in front at the start of the second half only for them to be pegged back by the visitors for a second time. Phil Blackwell netted from the penalty spot before Landless also scored from 12 yards to seal a thrilling 3-2 victory for Poulton that takes them up to fifth place in the table as a result. The team sitting directly below them in the table, Blackpool Wren Rovers, drew 1-1 in their home game against Vickerstown. Carl Eastwood rescued a point for them three minutes from time after Danny Keenan had given Vickerstown the lead. In Division One, a Ross Ainsworth double helped Lytham Town come from behind to seal a 2-1 win at home to Millom. They had earlier taken a fifth minute lead courtesy of Carl Waters. The victory sees them remain in top spot with 41 points from 19 games, a point ahead of CMB who have played two games more. CMB beat bottom-of-the-table Wyre Villa 4-0 thanks to goals from Mathew Chapman (2), Dan Crook and Ben Thornton.